Aperol is a low-alcohol content liquor made from bitter orange, rhubarb, and a secret assortment of roots and herbs. Aperol was originally produced by the Barbieri brothers in Padua, Italy in 1919. Compari is the current producer of the aperitif. While Aperol and Compari are made from similar ingredients, Aperol has only 11% alcohol content, where as Compari has has 20.5 -28%, depending on the country where it is sold. 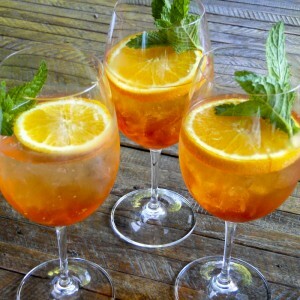 The Aperol spritz is the quintessential Italian summer drink, first concocted in about 1950. As the weather warms you see vibrant orange glasses on every corner restaurant, cafe and trattoria in Italy. An Aperol spritz is simply prosecco, Aperol and a splash of soda water over ice. With it's low-alcohol content, eye-catching color and refreshing citrus and herb flavor, an Aperol spritz is the perfect cocktail for a hot summer day. How can you not have fun drinking one of these? Pour the prosecco, Aperol over the ice. Top with a splash of soda water, a slice of orange and a sprig of mint.